Fatigued, dehydrated skin can appear dull and fine lines more prominent. Recharge your skin with a continuous boost of hydration for a smooth, energized, radiant look every day. 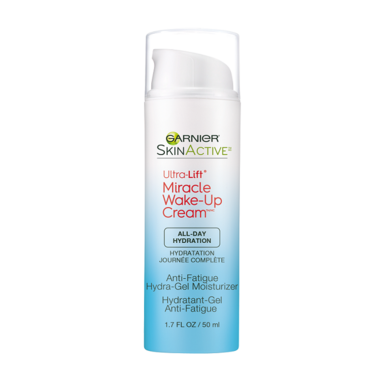 Miracle Anti-Fatigue Wake-up Hydra-Gel Moisturizer transforms on contact into a fast-absorbing liquid gel. Infused with Hydro-Glycerin and an Antioxidant Complex of Wild Berry extract, Vitamins C and E derivative, it gives your skin a continuous hydration boost to fight signs of fatigue for fresh, rested, youthful looking skin all day, every day. Skin appears fresh and awakened.